We are excited to announce that new kits for Mabel’s Sister are now available! Our newest kit uses Eden Cottage Bowland DK. This is a favourite yarn at Loop, so it was our first choice for another version of Mabel’s Sister. This special yarn is hand dyed in England and is 100% Blue Faced Leicester. It has a wonderful lustre, and is wonderfully soft and squishy once knitted. We have several different colour combinations available, all carefully put together by Susan, and then specially dyed for us by Victoria of Eden Cottage. The little details on Mabel’s Sister makes this design sing! There are three different kits available; Emily, Fiona and Susan. The sample shown in the photographs is knitted in the Susan colour way, which is Charcoal with Stonechat. Smokey pinks are a Loop signature, so we knew we had to have them in at least one of our new kits. 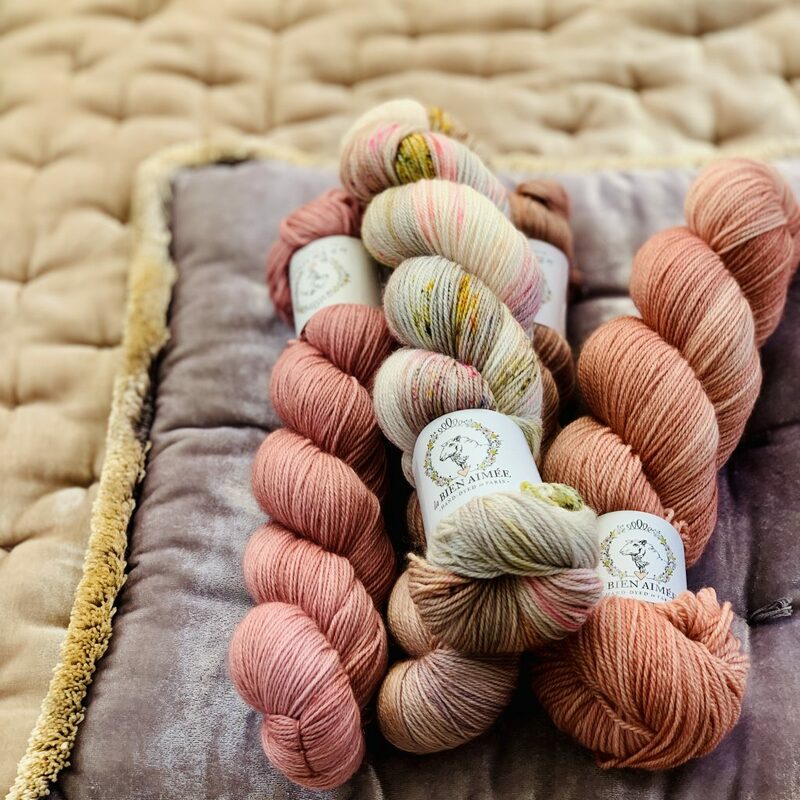 Emily’s colour way is Faded Bloom with Driftwood, the warm beige complements the pink wonderfully and is named after Emily Foden, the dyer behind the original yarn used in Mabel’s Sister, Viola Organic Merino DK. Fiona’s colour way is Coal with Steel. Fiona Alice, the designer behind Mabel’s Sister, is a big fan of greys and blacks, so this colour way is a little nod to her style. We have 3 different sizes of the kits available, as before. 1+2, 3+4 and 5+6. All the yarn quantities are listed over on our website, on the kit page. Mabel’s Sister by Fiona Alice for Loop. The kits are in our London store and on our website – and as always, we ship all over the world! These lovely new kits will also include the printed pattern for Mabel’s Sister and a Loop London cotton tote bag. The buttons we used on the sample shown are our Shiny Shell Buttons in muted pink, they’re 18mm and so the perfect size for the cardigan. Mabel’s Sister is the perfect cosy cardigan! We are so excited to be launching these new Mabel’s Sister kits! 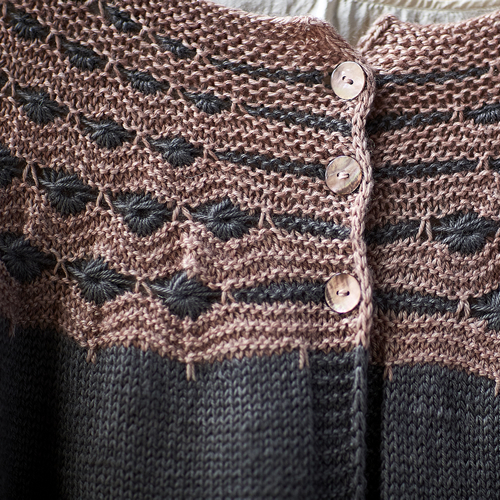 The Eden Cottage yarn is perfect for Fiona’s pattern – it has a wonderful drape and is just the perfect weight to hang nicely when the garment is being worn. We hope you like it as much as we do. There is now a fantastic video tutorial on our blog for the cluster stitch used in Mabel’s Sister. We know it can be tricky to pick up, so we have put our tutorial together, so you can knit along step-by-step. More Bowland DK should be with us over the weekend too in case your preferred colour/size sells out. More kits will be made up soon! There are also several exciting pieces of news we would like to share this week! The first is the winner for last weeks giveaway! The lucky winner of the Woolly Mammoth Natural Sock mini bundle is Karen Phillips – congratulations! We will be in touch via email, and we will be sending out your yarn very soon! Thank you so much to everyone that entered. We will be running more giveaways in the future so keep an eye on our blog and Instagram, and make sure you sign up to our newsletter to say up to date with everything going on at Loop. Our second piece of news is that we have received an incredibly exciting delivery from La Bien Aimee. We are now stocked up with Merino Singles and mini skeins of the Merino Singles, as well as the Merino DK, which is brand new to Loop. We are over the moon to announce we now have a Loop exclusive base debuting from La Bien Aimee! This base is called Cashmerino, and is a gorgeous squishy blend of merino, cashmere and nylon, with a very generous yardage. This yarn is exquisite – incredibly soft and the colours are stunning. 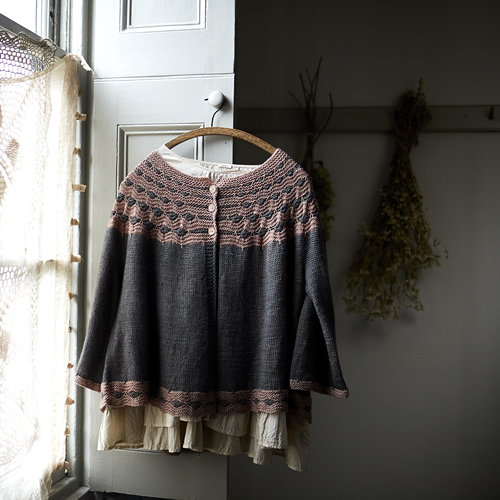 La Bien Aimee Cashmerino in Bois de Rose, Fiori, Clay and Dawn – such beauties! All images by Kristin Perers and Susan Cropper, copyright of Loop Knitting Ltd.
Several new-to-Loop colours arrived in this most recent delivery too – we might have the perfect colour to complete your project. The La Bien Aimee yarns do tend to sell out quickly, so we recommend that you have a look now, while we still have stock! Lastly, we are now fully stocked up with the newest colours from Brooklyn Tweed. Two new marl colours have arrived, Caraway and Amaranth, and they are available on both the Loft and Shelter bases. Newsprint, Narwhal and Caribou are now also available on Loft (previously only on the Shelter base). 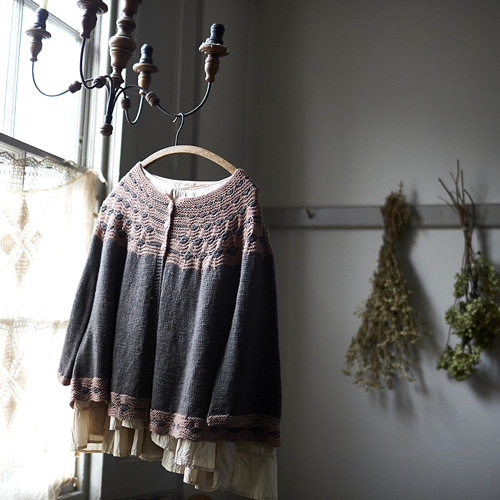 ‹ Naturally dyed loveliness from Woolly Mammoth Fibre Co.